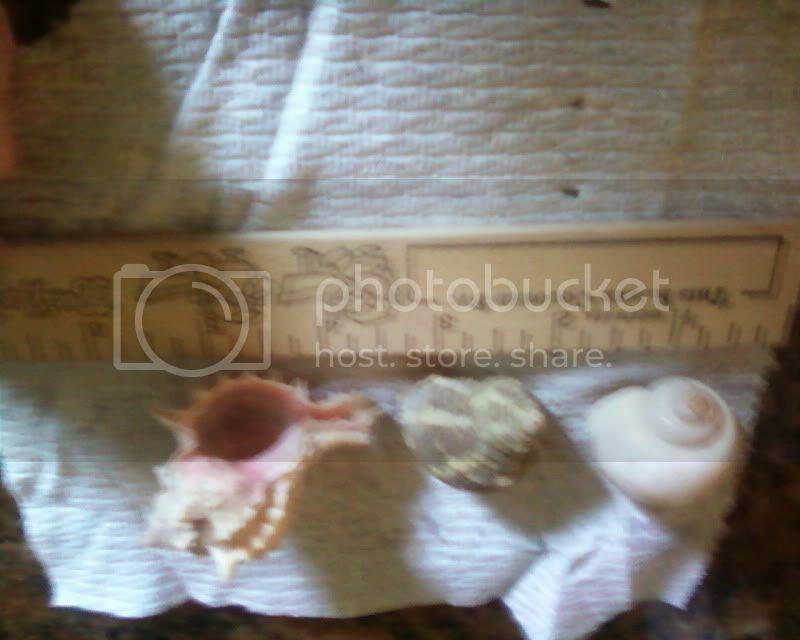 I have several teeny shells that I no longer need... some of them are very nice. I had a large crab dig up one of my teenies during a molt and eat him. Now this same large is in desperate need of more shells, and some shells to fit him as he grows into his "jumbo" stage, which I feel will be soon. I've looked around at pestores and other places and none of the shells are large enough. I will swap several teenies for just one or two jumbos! If you give me measurement I can see if the big ones I have will fit. I got some shells of craiglist and they gave me some huge shells that I wont need. When I get home tonight I'll measure them and post the measurements. How small are your shells?? There are 6"-7" shells and 3" to 5" shells. THey are striped fox conchs (My favorite type ). Okay, here are the small shells I have. 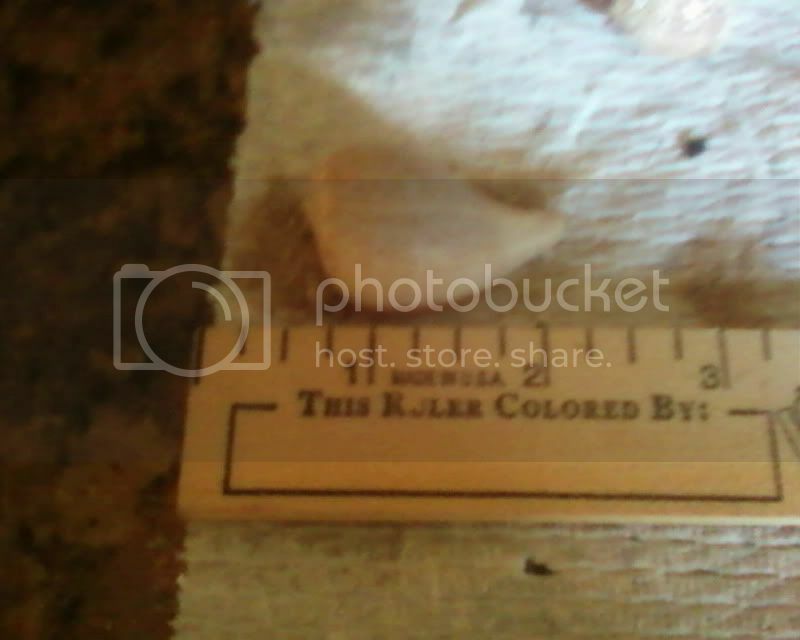 I put a ruller next to it so you can see about what size they are. Sorry about two of the pics being upside down... I didn't realize that my camera phone was upside down. And they're kind of blurry, but you can still see what they are. Okay well now it won't let me post pictures so I'll just put a link. Here is Goliath. She keeps getting back in her old tiny shell that doesn't fit her right.. I have two others for her but she doesn't seem to like them. Also she doesn't hang out of her shell as bad as it looks... she was trying to run away and I was holding her back so she was stretching far out. 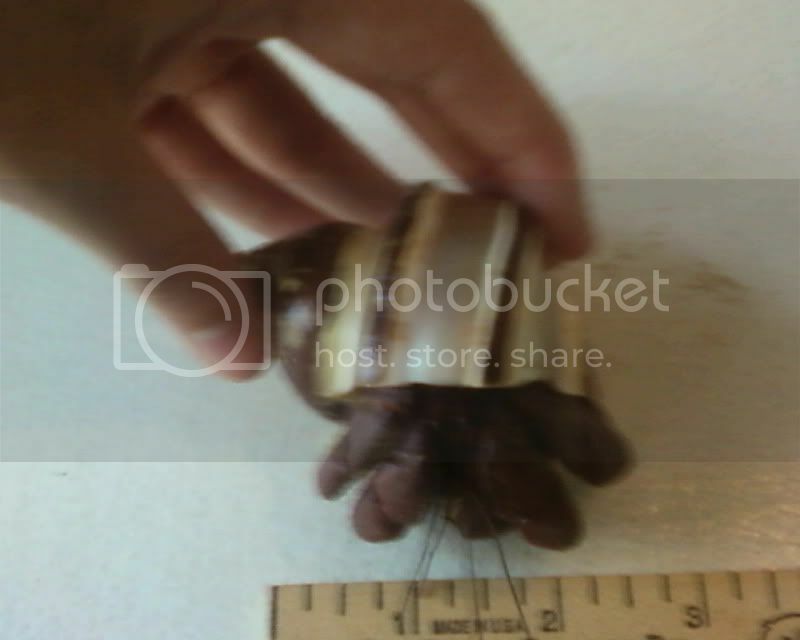 Crabbytalk.com - Hermit Crab Care, food/diet, crabitats, & pictures of land hermit crabs How Big are Hermit Crabs? Yes, I know he is a large, but I would like to have some jumbo shells for him to swap into, because he is busting out of his large shell now. I don't have any shells larger than a "large" size, and I always like my crabs to have the option of bigger shells, is the problem.